How new is the new inflation target? Sweden's Riksbank meets to set interest rates tomorrow (Thursday) and will also release a new Monetary Policy Report which will include a detailed set of macro and financial forecasts. Press headlines will probably be grabbed by an expected decision to shift the inflation target to core (CPIF) from headline (CPI). But this switch should hardly come as a surprise since it was floated in the Spring for a possible implementation tomorrow. Briefly, the reason behind the switch is CPI indirectly includes mortgage rates - so when the Riksbank cuts interest rates to generate higher inflation, lower mortgage rates generates lower headline inflation - and that creates difficulties for Riksbank communication. The move should also come with what's called a plus/minus 1% 'variation band', which the central bank stresses is not a tolerance band (ie, it will still target 2% inflation, but CPIF instead of CPI). 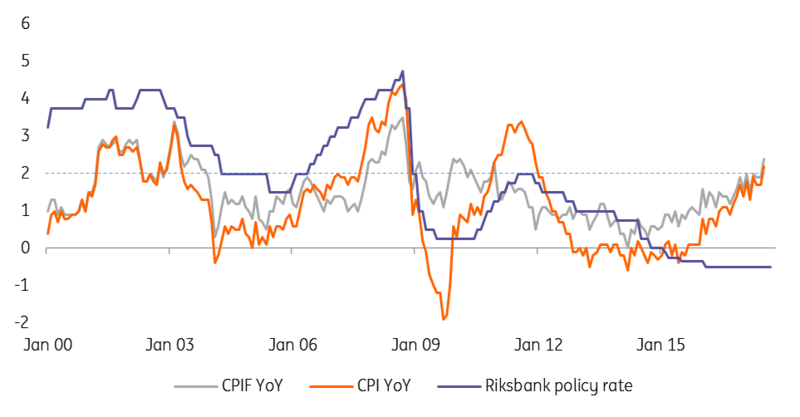 While the market may get excited that CPIF is currently above CPI ( 2.4% YoY vs 2.2% YoY) and be intrigued by a potentially more hawkish Riksbank position, the reality is the Riksbank has been using CPIF as an operational target for many years. When it comes to monetary policy, it seems unlikely the central bank will follow in the Bank of Canada's footsteps and do a U-turn on dovish policy. The minutes of the last meeting in July revealed entrenched dovishness, primarily a hangover from their battle with deflation. 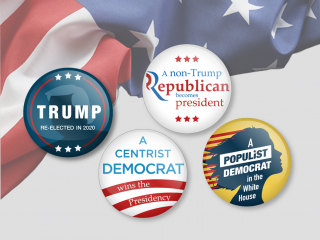 Some of the decision makers see the need for inflation to print above 2% for several months before reconsidering policy settings. Currently, that policy sees continued modest purchases of Swedish government bonds until year-end 2017 and the -0.50% policy rate not being raised until 3Q18. That position on rates is exactly what is priced in money markets right now. If the Riksbank did need an excuse to keep a super accommodative policy in spite of growth near 2.5% and inflation (and inflation expectations) above 2%, it would be the slightly stronger SEK. 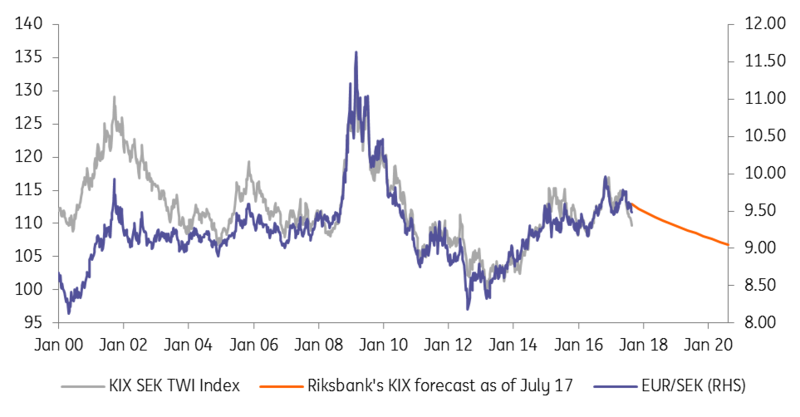 The trade-weighted SEK (KIX) is currently near 3% stronger than the Riksbank had expected in July - largely because of the unexpected decline in $/SEK - and the Riksbank could cite the stronger SEK as weighing on activity and inflation. Typically the SEK rallies into a Riksbank policy meeting and sells off into the (now) predictable disappointment that the Riksbank remains ultra-dovish. This week it seems that little change in Riksbank policy is priced. Thus the size of any EUR/SEK upside correction on Thursday will be limited. 9.53/9.55 resistance may, therefore, hold the EUR/SEK rally. Over time, we still expect the normalisation of Riksbank policy into 2018 to correct some of the SEK's under-valuation. 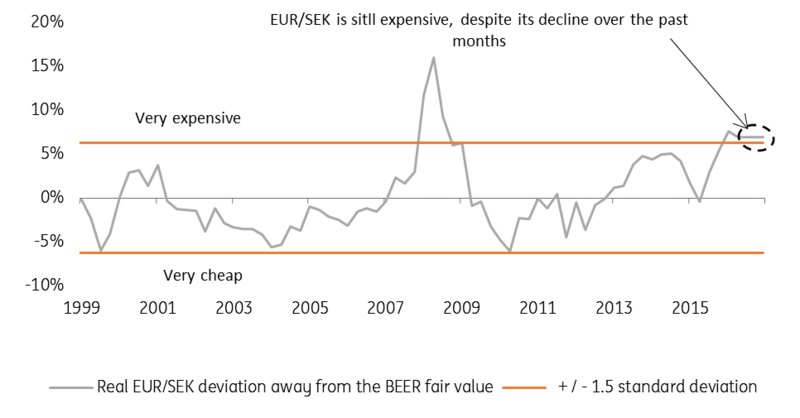 Our medium term valuation models still suggest EUR/SEK is still some 7-8% over-valued versus medium term fundamentals. Thus we retain a view of a modest EUR/SEK depreciation into year-end (9.10/9.20) and a move to 8.80 next summer when the Riksbank should be in a position to raise the exceptionally low -0.50% policy rate.